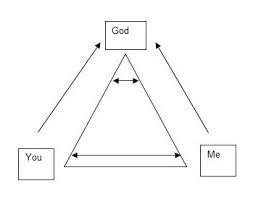 Well, this is about relationship between GOD & ME. I was just thinking of various relationships we are bonded with. The most unique of them all is the relation between GOD & ME. To discuss about its uniqueness, let me first elaborate on all other relations. What we expect normally in any sort of relation? – The other person shall respect the relation the way I do. – The other person shall express it the way I do. – The other person shall accept it the way I do. – The other person shall talk, think, act & feel the way I do. But, all of us are unique and have a different pattern to live life. We think different, we act different, and we feel different. There are some wise people who think beyond these lines and instead of binding by their own set of rules they believe in letting the other person stay free. There are no thumb rules for expressions and feelings. There are instances where people may not appear the way you want, but that does not means they don’t respect the relation. It is just that their ways are different. For instance, there are children who stand by their parents & assure them they are with them at times of need. They give the commitment. But, there are some, who do not commit anything but are always there when required. So, path is different but end result is same. In both cases, parents are getting attention and support they need. At times people fail to accept these differences and this is where conflicts arise. Now, before starting these conflicts just spend some time observing your relation with GOD. – We show our dedication, commitment, trust & belief in HIM. But, have you seen HIM? Have you got HIS response in the same pattern? Does HE listens and talks to you? Does HE show same dedication, commitment, trust & belief in you? HE never communicates back. HE never responds to my answers. Without a direct dialogue between me & HIM, I am unable to decide if HE really has some relation with me or is it just an illusion? But, HIS ways are different. I cannot see HIM but I can feel HIM. He does not respond in the same pattern but HE responds. HE listens, and answers, NOT in words, but in actions. If my feelings for HIM are true and pure, HE also responds back by trusting & believing me and giving me the best. If the feelings are true & pure, if the destiny has decided to gift you a particular relation then time does not matter, distances does not matter. We respect and worship GOD, and make our relation with HIM, which is without any boundaries despite of the fact that we are not able to see HIM or talk to HIM, just feel HIM. This may not happen in a day, but we all know if our feelings are pure, we can feel the experience of GOD listening to us, giving answers to us, and staying with us. In a similar manner, if we respect and worship all other relations in this world, with true & pure feelings we can surely break all barriers and experience the divine happiness of being a blessed child, a blessed sibling, a blessed parent, a blessed spouse, a blessed cousin, a blessed uncle/aunt, a blessed friend …and the list goes on.. This entry was posted in God, Relationships and tagged devotion, FAITH, family, feelings, friends, Life, prayer, Relationships, Thoughts, WORSHIP by Akanksha. Bookmark the permalink. Thank you so much for your kind words 🙂 Have a blessed day ahead..!! Though I do believe in God, but consider yourself born in alternate world where no one believes in God. Have been your opinion same. If not think as if by some event occurred resulting in non existence of God. Are your views still same in this new scenario? There can be infinite number of possibilities that can be imagined. It’s like questioning if Newton had not observed that falling apple or Archimedes has not observed that rising level of water, what would have happened? Will this world have been the same in terms of Physics, technology, gadgets & advancements? We frame opinions, theories & conclusions from what we see around us or from what we believe to be around us. With change in surroundings we can land up in a new theory but same conclusion or in a completely new theory with a different conclusion. But again we don’t see God and is creation of a group superior years back for self benefit without doing work say saints keep meditating and one day say to all that you got divine knowledge, get free food and services from followers. He might be existent and seeing us i am not contradicting it but what i wanna point out is there even a need of theory with God in it. According to science we evolved from monkeys, they from some other creature and so on. That clearly imply niether adam and eve nor manu and smriti were first humans who lived on earth. I simply find theory of God unfruitful. I believe in God but not for theoretical purpose but as an engineer who created us. Why he created us, i have personal opinions which i wouldn’t like to share momentarily, but will share someday in near future.